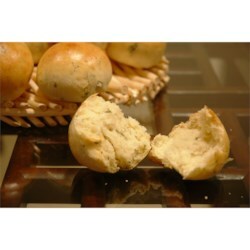 "Soft and tender dinner rolls with the wonderful smell of fresh herbs." In a large bowl, stir together the yeast mixture with milk, eggs, salt, butter, parsley, chives, and 4 cups flour. Add the remaining flour, 1/2 cup at a time, until dough has pulled together. Turn dough out onto a lightly floured surface, and knead until smooth and elastic, about 8 minutes. Lightly oil a large bowl, place the dough in the bowl, and turn to coat with oil. Cover with a damp cloth and put in a warm place to rise until doubled in volume, about 1 hour. See how to make rosemary pull-apart rolls from scratch. Delicious, have made it twice now. I found that I needed to add about 2 cups of water to the dough when mixing it to get it to pull together properly. These were nice, big, tender rolls. I only put 15 in a 13x9 inch baking dish and 3 in a pie plate. They took about 30 minutes to bake, and were very good. I added parmesan cheese. Thanks! This was the first time I have made bread, and the recipe turned out wonderful! I added about a 1/4 cup of parmesan cheese and it gave the rolls great flavor along with the fresh herbs. Very Good Bread. It thats a lot time to prepare, but it is worth it. Just make sure you have the time. So easy and yet so good.......Thanks for sharing. The recipe was easy to follow and my guest loved the rolls. My sister took several home to eat later. These were very tasty. Will definitely make them again.